Buch vom 5. August 2015. Ein experimenteller Abschluss eines Lebensabschnitts, ein foto- und reflexionslastiges Zeugnis von anderthalb Jahren Weltreise. 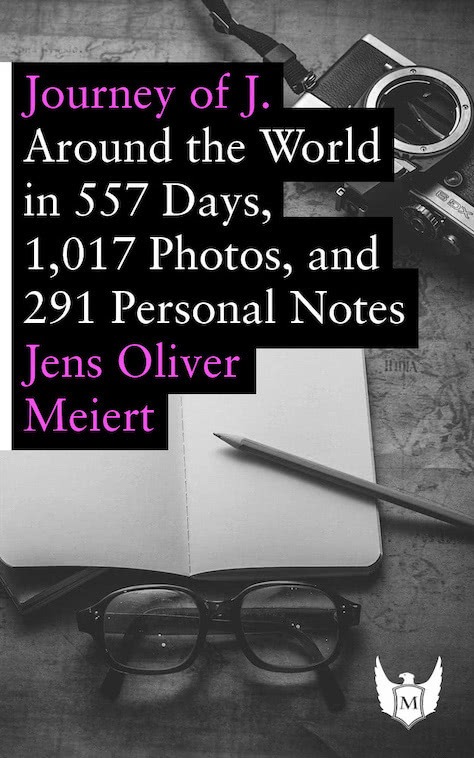 Having so far explored 6 continents, 70 countries, and more than 400 cities, Jens Oliver Meiert is a seasoned world traveler. Paired with an obsession to try whatever he can—documented in loving detail in 100 Things I Learned as an Everyday Adventurer —, Jens dives right into everything. If he wasn’t just a bit compulsive, too, one might even consider this experimentation all perfectly healthy. Jens is also a leading web developer and technologist (Google, W3C, O’Reilly) who has written several books about web development and design (including The Little Book of HTML/CSS Frameworks and On Web Development ). He’s now primarily dedicated to the study of philosophy and politics. Have a peek at his work by visiting his website, meiert.com. ❧ Am Buch wirkten außerdem Sarah M. Tyrrell (Lektorin) und Lalit Dalal (rechtlicher Gutachter) mit. Sie sind hier: Startseite → Publikationen → Journey of J.